This Feather Banner Is Designed For Both Outdoor And Indoor Use. This Custom Display Is In Stock And Can Ship Fast. There Are Dozens Upon Dozens Of Other Feather Banner Items On Sale Here. Package includes one full-color digitally printed feather banner custom artwork - see templates below. Comes with a carrying tote to conveniently transport flagpole to any location. Includes metal ground spike for use outdoors. 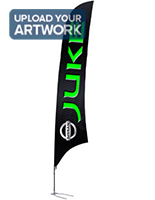 A blade flag, feather banner is the ideal solution for displaying your advertisements and attracting attention. 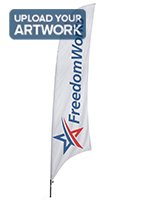 This custom advertising flag comes with one digitally printed unit, created with your provided artwork. Standing at approximately 17' in height, your message will definitely be visible to customers. This flying flag, feather banner is more effective than static advertisement displays. This custom outdoor stand features a fiberglass pole that is flexible and durable for use outdoors. Customers can place this feather banner in any busy area and let the flags move with the breeze to draw the attention of passersby. Customers can use multiple advertising units to create an even larger display. This custom outdoor flag, also called a feather banner or event display, has the ability to withstand moderate winds and weather. This unit can be used to showcase your advertisements anytime or anywhere. This outdoor display, feather banner is perfect for use at car dealerships, trade shows, sporting events, campaigns or beach parties. No matter what the setting is this stand will help to increase exposure for your establishment. 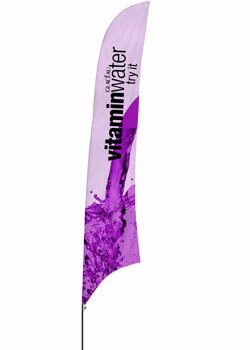 This feather banner comes equipped with ground spike, designed specifically for outdoor use. 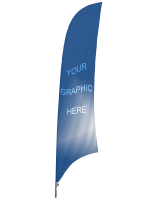 This feather banner will be shipped unassembled with easy set up required. One person can easily assemble this unit in mere minutes. This feather banner stands at 17' tall and is ideal for use by any business, to attract the attention of patrons and potential customers. 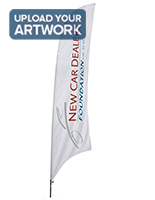 Customers can place this outdoor advertising flag at the entrance to a store to announce a sale, or upcoming event.